Subtitle Workshop is the most complete, efficient and convenient subtitle editing tool. 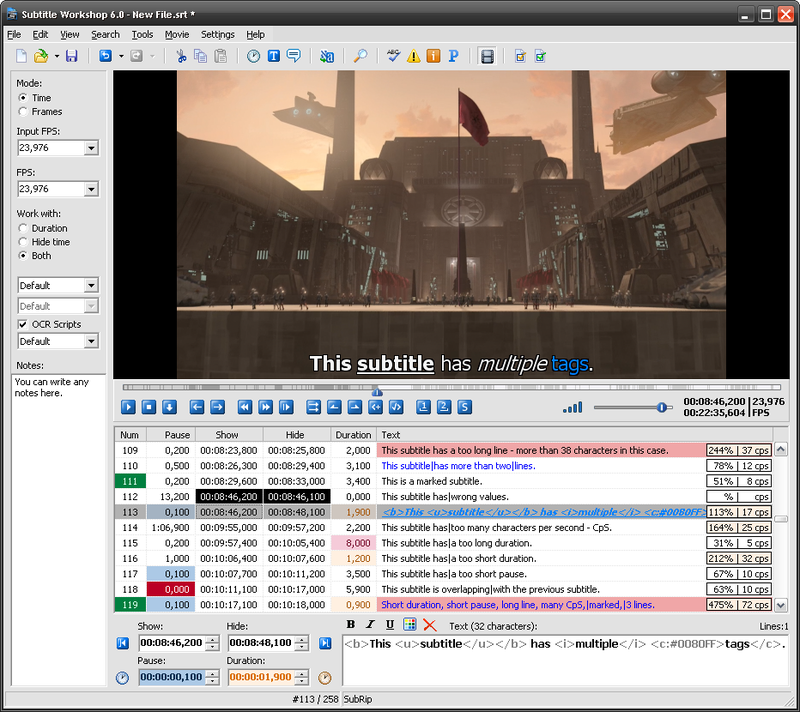 It supports all the subtitle formats you need and has all the features you would want from a subtitle editing program. Subtitle Workshop makes subtitle creating/editing/converting tasks almost a pleasure, the amicable and intuitive interface mixes easy to access menus & must have features with advanced functions and a remarkable speed and stability, drastically reducing subtitle editing time. It includes spell check function and an advanced video preview feature which will ease the task even more. The best choice for the beginner, expert or the fansubber. Have a try, and you'll forget the rest!. Based in URUSoft SubtitleAPI, so new formats can be easily added by downloading an updated dll file. Currently (version 1.05 of SubtitleAPI) supports around 56 subtitle formats. Supports reading and writing style tags (bold, italic, underline) and color tags in format which support it. Supports Output Settings in DVDSubtitle, SAMI, Sonic Scenarist, SubStation Alpha, SubViewer 1 & 2 and TMPlayer formats. Supports multi-language (currently over 35 languages are available!). Can switch between interfaces to adapt to the user's need, you can turn Video Preview Mode on and off and Translator Mode on and off. Integrated in the main window. Shows subtitles over the video. Can show information about the video you are watching. You are able to customize foreground color, background color (or transparent), show border or not, show shadow or not, border and shadow's width of the subtitles. NOT based in Windows Media Player, this results in a highly improved performance and visual quality. Possibility to mark errors in the main list with a different font style and color so that it is easy to identify them visually. 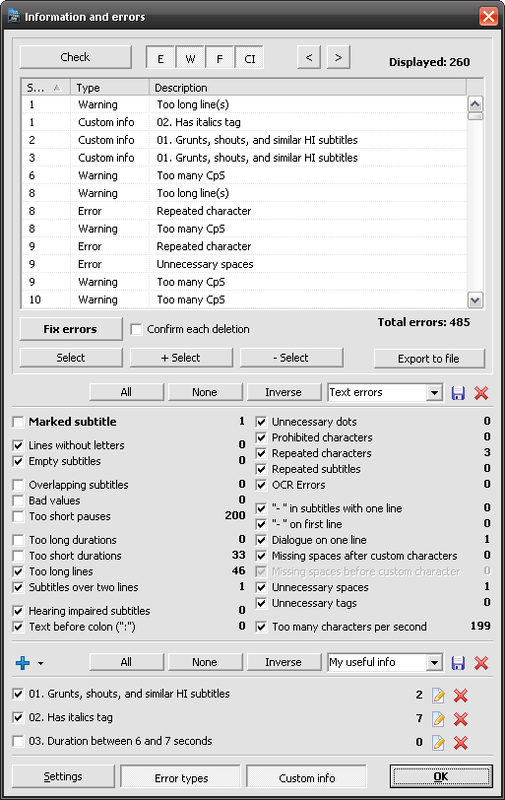 Checks and fixes (all are optional, you may configure it): empty subtitles, lines without letters, overlapping, bad values, hearing impaired subtitles, text before colon (":") (optional - "Only if text is in capital letters"), unnecessary dots, "-" in subtitles with one line, subtitles over two lines, prohibited characters (configurable characters), repeated characters (configurable characters), repeated subtitles (configurable time tolerance), OCR errors, spaces before custom characters, spaces after custom characters, unnecessary spaces, too long/short durations and too long lines (only check). Spell check using Microsoft Word's engine, so it supports any installed language. Easily add and delete subtitles with "Insert" and "Delete" keys. Can split subtitle (at selected item, at given item, at given time, at given frame, or at the end of video), or in an indefinite number of parts (equal in time, in lines or at the end of multiple videos). Can join an indefinite number of subtitles, and those subtitles may be in different formats with different FPS (you can select a different FPS for each file). Two methods of getting FPS from video: without using DirectX (only supports AVI) and using DirectX (supports all video formats, but it is slower). You are able to choose which subtitle extensions to associate. Supports drag & drop (subtitle files and video files). Recent files list (customizable number of recent files from 0 to 20). Set delay (positive or negative, time or frames). Set duration limits (maximum duration and minimum duration). Adjust subtitles using four possible methods: 1- first and last dialogs, 2- synchronize using two points (linear algorithm), 3- Adjust to synchronized subtitles and 4- Advanced system to synchronize subtitles using an indefinite number of points. Search & Replace text with "Match whole words", "Case sensitive" and "Preserve case" options. "Smart line adjust" to constrain subtitles bigger than three lines into two and adjust length of lines. "Convert case" with 6 different conversion modes. "Sort subtitles" to sort all the subtitles according to their start time. "Combine subtitles" to make all the selected subtitles become only one (for eg. "- Hi!" and "- Hey!!!" to "- Hi!|- Hey!!!"). Visual effects with the texts and times of the subtitles. Possibility to mark subtitles for later review (and of course unmark them) and read Subtitle Report Files (*.srf) generated by ViPlay. Bug fixed: Impossible to edit subtitles containing two-byte characters (Chinese, Japanese, Korean).